In sharp contrast to last year, which came in with a whimper and went out with a bang, the market for coastal homes in the South-West has got off to a flying start in 2010. Many vendors who hesitated to test the water in 2009 have decided to take the plunge well in advance of an anticipated May election. First stop for London buyers is sheltered Beer Haven at Beer on Lyme Bay, an appealing Arts-and-Crafts house above the historic fishing village, 11 miles south of Honiton. Jackson-Stops & Staff in Exeter (01392 214222) quote a guide price of £1.25 million for the flint-and-stone house, built for his own use in 1890 by local architect David Carr, and designed to withstand anything that wind and weather could ever throw at it. It’s been well modernised by the current owner, who is moving back to the north of England. Beer Haven stands in 1.8 acres of lovely wooded gardens, looking out across the east Devon coastline to Beer Head, and has three reception rooms, 4/5 bedrooms and two bath/shower rooms. Jackson-Stops are also handling the sale, at £2.95m, of the classic Georgian Springfield House at Tuckenhay, near Totnes, in the fashionable South Hams, which has spectacular views over Bow Creek and across the valley leading down to the River Dart. Impeccably renovated and extended by the current owners, who bought it as a wreck some 20 years ago, Springfield House is no ordinary coastal retreat. It stands at the end of a private drive surrounded by 5.8 acres of gardens and grounds, which include a walled garden with a heated swimming pool and terraces, an orchard, a tennis court and a paddock. The rooms are elegantly proportioned, with high ceilings and fine fireplaces, and include three main reception rooms, a kitchen/breakfast room, a master suite with a conservatory overlooking the river, five further bedrooms and two further bathrooms. ‘We used to have seasons down here, but not any more,’ sighs Robin Thomas of Strutt & Parker in Exeter, who has ‘never known a January as busy as this’, in spite of the weather. If sea views are a must, then lofty Temeraire on Swannaton Road, Dartmouth-for sale through Strutt & Parker (01392 215631) at a guide price of £1.35m-could provide the perfect answer, and an excellent investment to boot. The present owners, who bought Temeraire in 1999, have lived there themselves and also rented it out for lucrative holiday lets. It has 4/5 bedrooms, three bath/shower rooms and large terraces for blissful outdoor dining and dramatic views over Dartmouth. Having seen a rush of coastal property deals signed off in the second half of 2009, Rick Marchand of Devon agents Marchand Petit expects the trend to continue in 2010, with prices rising on the back of limited supply. ‘But it would be a mistake to expect prices to regain the dizzy heights achieved in the boom-time of 2007,’ warns Mr Marchand, whose Dartmouth office (01803 839190) has re-launched Lidstones on the waterfront at Dartmouth, at a reduced guide price of £1.85m; Richard Blake (01803 832288) is joint agent. The recently renovated converted boathouse, which has views along the Dart and out to sea, has an open-plan living room, dining and sitting areas, a modern kitchen, three bedrooms, three bath/shower rooms, a landing stage and a large garage nearby. Across the Tamar in Cornwall, Jonathan Cunliffe of Savills in Truro (01872 243200) quotes a guide price of £2m for dreamy, south-facing Weatheroak (pictured) on the Percuil River, a mile from exclusive St Mawes by boat and 16 miles from Truro via the King Harry car ferry. The tiny hamlet of Percuil consists of a small boatyard and a handful of houses fronting the river, with much of the surrounding countryside owned by the National Trust. For sale for only the second time since 1957 following the owner’s decision to emigrate to Canada, Weatheroak has been beautifully refurbished and extended and is in ‘perfect apple-pie order’, Mr Cunliffe says. The main house has two reception rooms, a large ‘live-in’ kitchen, three double bedrooms and two bathrooms; the converted sail-loft nearby has a huge open-plan living area, two more double bedrooms and a shower room. Grounds of 1.75 acres include delightful gardens, a double garage, a large boat-store and a long private river frontage with an outhaul mooring. Further up the Fal estuary, Savills are also handling the sale, at £1.5m, of idyllic Ardevora Manor, near the ancient Roseland village of Philleigh, a former staging post on the old coach road from London to Penzance. In true Swallows and Amazons style, the charming, 6,737sq ft, Georgian manor house sits in 7½ acres of gardens, meadows and ponds on the edge of tidal Ardevora Creek, overlooking the Fal valley and the rolling acres of Lord Falmouth’s Tregothnan estate to the north. The house has two reception rooms, a kitchen/breakfast room, five bedrooms, three bathrooms, an office complex, a large indoor pool, a folly and a boat store. Further west, the unspoilt Helford estuary stretches from the outer edge of Falmouth Bay to the old port of Gweek. 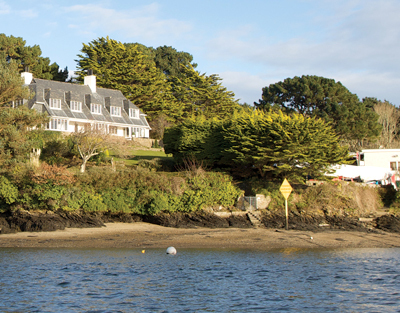 The once-thriving, nearby port of Port Navas, now a haven for boating and wildlife enthusiasts, is the backdrop to pristine Bosryn, an immaculate creek-side retreat for the serious sailor, with splendid gardens, a boathouse and moorings, a slipway, 230ft of water frontage and a private quay. The house has 1,971sq ft of luxurious accommodation, with a large open-plan living/dining area, a kitchen/breakfast room, four bedrooms and three bathrooms. Knight Frank (01392 423111) and Berry & Co (01326 250862) quote a guide price of £1.85m.